I read with great interest Jim Miller's claim of a G4 MDD with a pair of FW800 ports. I worked for an Apple Reseller in Canada from 2003 to 2005, and no such machine ever made it onto our price list nor came into the service department for upgrade or repair. His letter is the first I've ever heard of such a beast. I remember checking the logic board of the 2003 MDD and finding it identical to first generation MDDs in every respect - layout, slots, external ports, AirPort slot, etc., and I can't believe Apple would design a new OS 9 capable motherboard a year after their highly publicized mock funeral for the OS. I remember the 2003 MDD in particular, because it was one of the first Macs we ordered from Apple in custom configurations. Up until then, almost all Macs arrived in a standard configuration and modifications were done in house to meet demand. Initially we sold more dual 1.25s than we did single 1.25s. This may have been because so many of our customers were in media creation, and software like Photoshop had been multiprocessor aware for years, but I think mostly it was a simple matter of math. Two 1.25 G4 processors for the price of a single 1.6 G5 made the G4 look like the better deal. Once the dual 1.8 G5 arrived in the fall of that year sales of dual 1.25s dried up. Thanks for writing. There's a lot of life in those "old" MDD Power Macs - and every G4 Power Mac with AGP video. And there's still life in Mac OS 9, despite the mock funeral. I use it in Classic Mode every day as I continue to plug away in Claris Home Page, a great WYSIWYG HTML program last revised over a decade ago. Good tools never go out of date. I just picked up a 2003 last-of-the-line Mirror Drive Door Power Mac G4 myself last week. It's my attempt to surpass the troubles a Rev. A B&W G3 was giving me! Anyway, I can attest that the machine does indeed have two FireWire 400 ports and no FireWire 800 ports. It also has AirPort instead of AirPort Extreme, so is to all intents and purposes a reissue of the Power Mac G4 before the FireWire 800 model. Clearly, its purpose was all about native boot into OS 9. It's a fine enough machine in Leopard by the way (I know you have a Mirror Drive Door G4 too), and I'm currently filling it up with my old drives and the massive horde of data they contain from my habit as a digital pack rat! The other thing is a comment about the power supply tick of death Fletch wrote in about. I have heard it too. But not in a Mac, but rather an ancient IBM PS/2! A friend of mine picked up a pair of them from an office he was called in to outfit with much newer systems, already many years ago. He stumbled into one while moving home recently and I dared him to try it out with OS/2 . . . just out of curiosity. Alas, all the little pizzabox shaped flatbed desktop will do is click loudly when hooked up to power, so its power supply must need attention. To be honest, I would have thought this kind of problem would be quite common in classic computers. Aren't compact Macs susceptible to power supply troubles as well? Anything that's lasted from 1990 and before is daring the odds with component lifetimes. Thanks for confirmation on the final revision Power Mac G4. Yes, the Mirror Drive Door models are great, and mine runs Tiger very nicely - and handles Leopard reasonably well. There were power supply issues with early compact Macs, particularly the Mac Plus. First of all, thank you so much for publishing Low End Mac! I've been a daily reader since the Intel Macs came out in 2006. It was your site as well as one of my close friends who convinced me to buy my first low-end Mac, an iMac G4 1 GHz. Before that I had been using Windoze for 8 years, and my mom's college Mac Plus before that. I am writing to say that I really appreciate the Windows Death Spiral article. I first looked at Frank Fox's article about Paul Thurrott's piece, and when I saw the headline I immediately thought that something was out of whack. I then read Thurrott's article and clicked out of it about halfway through. Then I read your piece and realized just how good you and the entire Low End Mac community of writers are at portraying the facts in a straight way so that all of us readers can see the truth right away. Thanks again for keeping the info on LEM high quality and easy to read! Thanks for writing. One of the things I like about Low End Mac is the diversity of opinions. Frank Fox has one take on things; I have a slightly different perspective. We don't try to speak with one voice, and we sometimes disagree on things. That's healthy. It's when we see tripe like Thurrott's that we really want to jump in and debunk the nonsense. Frank did it by pointing out, as HP has recently reiterated, that a whole lot of Vista sales are really Vista licenses for Windows XP installations. I did it by adding the Mac and Windows installed base figures and graphically showing the decline of Windows. I hope we don't come across as Apple fanboys too often. We love the computers, the operating system, and such, but we also realize that Apple and Steve Jobs are not (quite) perfect. We'll keep the analysis coming. Well here's the report - I printed out the webpages Steffen gave the link to for repairing the Dock's power supply and showed the guy who was selling the Dock what I needed to do, lamenting about my lack of soldering skills, and he said, "Well, I think I should be able to do it myself." So I helped him get the case open, and then he used a hand drill (!) to grind out the rivets holding the power supply together. Then we realized the failed capacitor was hidden under the circuit board, and decided the rest of the job would need to wait until later. I came back a couple of days later to help him out with the rest of the job as much as I could, and as I walked in the door I saw he had it all put back together again, and it was just as he was sliding the Duo into the Dock. Lo and behold, it sucked the Duo in and "whoosh", the startup sound played! What a surprise; I didn't think he'd get it done so soon and so easily. He said he wound up using a 120 farad cap instead of a 100 farad one, but that it was within tolerance. Now all I gotta do is figure out where to find a new battery, since this Duo's is dead, and how to install a SCSI drive in the Dock (or rather, how to snake a ribbon cable from below the motherboard in the drive compartment, up to where the connector is). Plus one guy on DuoList has an external ethernet-to-WiFi access point attached to his, and I can't figure out what he plugs it into, since the Duo only has serial and modem telephone ports. Unless he carries a Minidock around with him. Thanks for sharing your success. I've been corresponding with Sean Cleary, the author of that page on repairing the Duo Dock, and we'll soon be mirroring it on Low End Mac. It's a great resource. I suspect the guy on DuoList has an ethernet NuBus card in his Dock. Well here's the final tally after we finished clearing that guy's office out. For $125, I got the Gigagbit Power Mac G4, the PowerBook Duo 2300c and repaired DuoDock II, keyboards for both, an old LaserJet 4P printer that had only 25,000 pages printed in its lifetime, an almost-as-old Canon 11x17 inkjet printer with a Mac serial port (and all documents and software for both printers), an old SCSI Zip Drive, a set of powered speakers, two whole floppy disk flipfile boxes full of old Mac software, System 7.5.3 boxed, a grab bag of half-a-dozen or so old RAM sticks, and a few power strips and superlong ethernet cables. For another $40 from two other sources I got the 733 MHz Digital Audio G4 CPU and a 256 MB stick of RAM for the G4, and three old cheapo scanners to see if I could get working (an Agfa SnapScan 1212u, an HP ScanJet 3300C, and a Umax Astra 3400). This is my best old-stuff deal since my Great Vintage Macs List Trade of 2003, when I got an LC, LC II, LC III, IIci, and two monitors for a busted microwave oven. Thanks for all your help again Dan. Quite the bargain! If you're not happy with the scanner software or can't get these older scanners working with OS X, check out the VueScan scanner software from Hamrick Software. It can give new life to a lot of old scanners, including the Minolta Dimage III film scanner I have which otherwise doesn't have any OS X support. Got the 4 GB Samsung "280x" cards and have them installed. In my two Duo 2300c's, they seem to operate overall about like the 2 GB 5400 rpm IDE drives they replace; I am satisfied and plan to leave them in. They do seem a bit faster on most reads. Supposed to read/write at 36 Mbyte/sec average and 20 Mbyte/sec minimum. In the P3 500 ThinkPad with XP Pro SP3 (workgroup mode), it seemed overall slower than a 5400 rpm drive, enough so that I would not replace the drive unless I badly wanted SS operation. The Samsung's do both seem at least 50% faster than the 16 GB A-data I tried. Thanks for sharing your findings. Flash memory writes slower than it reads, and the more an operating system depends on virtual memory, the more that can be a problem. This is one of the reasons Solid State Drives don't tend to do especially well with Vista - and Windows XP may be suffering from the same issue. More RAM is probably key to overcoming the problem. Glad to hear you've improved your performance so much. I would like to add my comments to the dialogue sparked by Frank Fox's Apple v. Psystar commentary. First, I would like to complement the tone of the dialogue. Civility should come as natural as breathing and be just as essential. However, in the Internet world, this is not the case (just check out the comments on Paul Thurrott's site). I am impressed with this dialogue, and I have always been impressed with this site, after ten years of reading it, and its maintenance of the civility of its discourse. Thanks to all! I don't know a whole lot about the arena in which this suit will play out, so I don't have an opinion as to whether Apple will win (my gut says yes). However, I have a few observations. I believe that since Psystar bundles with its hardware the system software it bought from Apple (presumable at retail), it will argue, among other things, along the same lines as the cloners did - that it doesn't pilfer from from Apple's market share, but rather expands it. Apple sold to Psystar a copy of software it wouldn't otherwise have sold. Thus, Apple profits from that sale. Apple doesn't lose, because Apple wouldn't have sold that copy of software, nor would it have sold the computer that came with it, without Psystar's willingness to hit the price point on its hardware that its target market craves (a market Apple won't reach under its current pricing scheme). I am an attorney, but I do not practice in intellectual property, so I don't know much about EULAs. But my guess is that the successful EULA suits protect the consumer, not a business, and especially not a competing business. The arguments around EULAs seem to swirl around whether the consumer, not a competing business, is getting shafted. This would explain why distribution of one copy of software on eBay by a consumer-turned-eBay-seller is not pursued (the EULA would require the seller to remove the software from all of the seller's devices - how much does that actually happen? ), and why also not pursued are users who install a Mac OS on foreign hardware, or even publish on how to install on foreign hardware. Comparing the distribution of Windows Vista to the distribution of Mac OS is like comparing Apples to oranges - Microsoft specifically licenses its software, and it is not a hardware provider for devices running its own OS's, except for maybe the Xbox. Apple, on the other hand, requires in its license that the Apple OS run on Apple-manufactured hardware. I think that Xbox may provide a thought-provoking, if not necessarily complete, analogy. Apple attaching its OS to its hardware is similar to the game hardware manufacturers attaching their specific OS to their hardware. The analogy isn't obvious, because dedicated game hardware producers don't expose the OS very often. But would Sony tolerate the transplant of its PlayStation 3 OS onto hacked hardware produced by a fly-by-night Internet retailer? Would it succeed? More relevant to this conversation, would Sony succeed even if the retailer was fashioning its own boxes with ROM chips transplanted from PlayStations purchased at retail (and producing profits from the use of generic, off-the-shelf components in its hacked systems)? Isn't this argument akin to the argument regarding Psystar's resale of Apple software purchased off-the-shelf? Or, for that matter, would Microsoft succeed with a similar challenge to its Xbox technology? The argument was offered that if EA linked its games to a specific (presumably EA-produced) controller, wouldn't that be illegal? Apparently not, since similar activity linking software to hardware occurs all the time in the gaming industry. To play Xbox games, you need the Xbox OS, which requires an Xbox to run. Anyone play the Halo games on a WII yet? I would expect Psystar to reply that the game console manufacturers don't offer their system software for sale decoupled with the hardware, as Apple does. I would expect Apple to rejoin that the console manufacturers are different from the PC manufacturers in that the hardware and software of PCs aren't intended to be upgraded at the same time, as are the game consoles. The complications are endless, and endlessly fascinating. Regardless of the outcome, I don't blame Apple any more than I blame any other corporation for vigorously defending the unauthorized use of its intellectual property. Nobody argues that Psystar's use of Apple's intellectual property is authorized by Apple (as Microsoft did defending its licensing agreement with Apple in the 80's). The controversy here is only whether Apple's limitations on its intellectual property are legal. If Apple is going to put the limitations in place, why holler at them for then trying to enforce the limitations? Once a person reads that certain practices regarding intellectual property are prohibited by the creator of that property, can that person realistically expect to disregard those admonitions and not suffer the consequence of, at best, the costs of successfully defending its practices in court? Apple's innovations have, over decades, hugely enhanced the interaction of millions with the insular universe of technology. Apple creates and sustains a sense of wonder and possibility in the technological universe in a way that no other company can touch. Apple may lose this suit, but if Apple believes that it must protect its intellectual property in this fashion in order to continue operating in this tradition, that's okay by me. I think Apple was wise to give Psystar enough rope to hang itself. If Psystar had merely made a clone that end users could install Mac OS X on, I don't think they would have incurred Apple's wrath. If Psystar were an authorized Apple software reseller and sold it with its clones, I don't think Apple Legal could have done anything. But Psystar built a clone and sold it with a copy of Mac OS X installed fully aware of the terms of the EULA. That was enough to get Apple's attention, and then when Psystar downloaded Apple's Leopard update, modified it, and made it available on its website, it crossed the line. There is no way that Psystar is authorized to modify and distribute Apple's copyrighted software. Case closed, at least from my perspective. We'll see how it plays out in court, but I doubt Psystar will survive the encounter. On PCs, they're both marked Enter. There's no need to have one key marked Return and the other Enter, which Apple has been doing for 20 years now. Whatever the label, they do exactly the same thing. Actually they don't do the same thing. In most programs they do, but there are programs in which there is a distinction. The most common of these is Excel, in which I believe that Return goes to the beginning of the next row and Enter proceeds in whatever direction you've been navigating in, be it down or to the right. An easy to test distinction is in iTunes, in which you can use the arrow keys to select a song. Return will play it while Enter will select the song title for renaming. In any case I think that the Enter key is going the way of the dodo, so perhaps this isn't a worthwhile nitpick. Thanks for the column. Anything that pressures keyboard makers to create the perfect keyboard is very welcome. Currently there is no such beast, though that MouseDream thing looks like it comes close. Thanks for writing. I think the fact that Apple no longer has separate Enter and Return keys on its notebooks or the wireless aluminum keyboard speaks volumes to the distinction being dead as a dodo. I have to say that it's about time someone created a new keyboard that touch typists could use with almost no adjustment - no strange "ergonomic" shapes, no different alignment of the keys, no moving constantly used keys (such as Shift and Tab) away from their current locations. The MouseDream design eliminates that not quite useless Caps Lock key while providing a pointer you can access from the keyboard - brilliant. MouseDream is practically perfect - expected key placement, dedicated navigation keys, and full sized arrow keys. Add Esc and F1 through whatever across the top, and you've got a great keyboard design for notebooks (maybe even the 13.3" MacBook) as well as desktop user who don't want or need a numeric keypad. I enjoyed your article and agree that the current keyboard layout could be improved. I ALSO OCCASIONALLY HIT THE CAPS LOCK and Help keys by accident. As for the Return and Enter keys, they do not do the same thing in all applications. Excel sometimes can tell the difference, and some dialog boxes cannot be dismissed with the Enter key, you need to press Return or use the mouse button. Also, the Escape key is invaluable for users of PowerPoint to terminate a presentation that is being developed so that a slide can be edited, or to stop a presentation in the middle if the time for it has run out. It is very conveniently located for this purpose. Thanks for writing. I can see where an unmarked keyboard would have a certain geek cred, but I don't think I could ever get used to it - even though I've been a touch typist since high school. As you know from my Model M article, keyboards are near and dear to my heart, or at least my fingers. On my Macs, I take the rather draconian step of disabling Caps Lock in System Preferences, though that is annoying when I need to type in ALL CAPS, which comes up occasionally. For serious writing projects I still prefer my trusty old ThinkPad precisely because of IBM (now Lenovo's) take on CAPS LOCK. They have a little utility that allows the user to add a delay to certain keys, including CAPS LOCK. I can enable CAPS LOCK by pressing the key and holding it a few seconds. A single short tap will do nothing, but the long, continuous press engages the key with the same deliberate action required to disable it. I also like the IBM keyboard layout's inclusion of both delete and backspace, which is faster than using FN+Delete to get true forward-delete functionality. Other than those minor issues though, Apple's keyboards are excellent. Like the guy with the blog, I love the aluminum USB keyboard and have one both at my home and my office. It is so refreshing when using a laptop to have almost no change in layout or feel when moving from desktop to laptop keyboards. I like the idea of having essentially the same layout on desktop and notebook computers, and I just love working on a good keyboard (like my aging Logitech). The right keyboard just gets out of the way. I applaud IBM's take on Caps Lock, which solves the problem without relocating or removing the key. Apple, here's an idea worth picking up even if you have to pay a royalty to use it! If you find the cable on a USB keyboard too short, USB extension cables can be added very cheaply - I've just bought a bunch of these for my school (so that kids with USB memory sticks won't have to fuss with plugging them in at the back of our older desktops), paying $1.50 for 3' extension cables and $2.00 for 6' ones at a local Dollar Store. The biggest problem key that I see at the (PC-using) elementary school where I teach is the Insert key; kids - and even teachers - hit it by mistake, and suddenly their word processor is in overwrite mode rather than the default insert mode. There's usually some sort of notice of this, but users generally don't notice that. All they know is that suddenly the computer is 'eating' up text, and they don't know how to stop it. Yeah, Big Lots and dollar stores can be great places for finding things like computer cables on the cheap. Thanks for the note on the Insert key. I'm sure that will help a few people know what to do the next time it happens to them! I enjoyed your Musings on keyboards. Any change is going to upset someone. One product for which I program makes frequent use of the Insert key, perhaps because it's spare with no obvious use. Using AppleWorks spreadsheets, I had it configured so that one Enter/Return key moved to the next cell below, one to the next cell to the right. Very useful, and missed in Numbers. The Ctrl key position may be second nature, but unfortunately it also has to have a third nature for those who use Macs and PCs. The key labelled Ctrl may be bottom left on an Apple keyboard but the functions like Ctrl-X, Ctrl-C, Ctrl-V on the PC use the Apple/Command key, which is next to the Space bar. Anyway, I believe changes should be made for the greater good, even if I lose a favourite anomaly. With that in mind, here are my votes. Get rid of the Caps Lock key, which I only use by accident. A side benefit is that it might stop the odd person from typing in all caps. Get rid of the numeric pad. Squeeze up the arrow keys and lose Page Up/Down etc. The mouse can now move six inches to the left reducing strain on the right arm. (The latter said with feeling.) You can deduce from this that I like using the mouse for navigation more than keys. I know a lot of people don't like reaching for the mouse, but if it weren't so far away they might not mind so much. If I ever buy a new iMac, I would opt for the wireless keyboard even if it had wires. I got a real kick out of your last line. 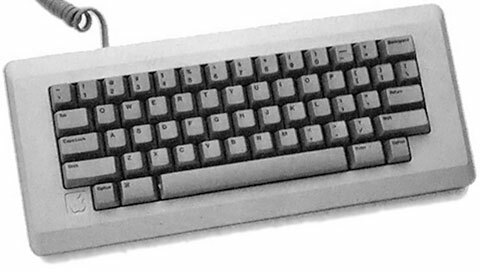 :-) The original Macintosh keyboard didn't have a numeric keypad - or arrow keys. Or navigation keys. The idea what that you had to use the mouse. Apple got smart and realized that arrow keys made sense, introducing them along with the numeric keypad with the Mac Plus, although they weren't yet in the inverted T configuration we're used to today. From there, the keyboard just grew huge with the 1987 introduction of the Extended Keyboard. I know I'd be lost without the arrow keys, but I could get by without the number pad. As you note, that could easily trim 6" from the width of the keyboard. Apple's current wireless keyboard goes a bit too far by eliminating full-sized arrow keys and dedicated navigation keys. While I agree with 99% of what you said, I have to say "Wait a minute, there!" to one suggestion. "On PCs, they're both marked Enter. There's no need to have one key marked Return and the other Enter, which Apple has been doing for 20 years now. Whatever the label, they do exactly the same thing." In AppleWorks, and perhaps other word processors, Return starts a new line or new paragraph, while Enter starts a new page. There are times when you need that functionality. In spreadsheets, Return can be used to go down to the next cell, while Enter can be used to go sideways to the next cell, very handy when entering a lot of numbers. I applaud your effort to move Caps Lock. I hit it at least once per day when I meant to type an A, and get a line of capital letters that I have to erase and retype. But please don't remove Tab. It's very handy for filling in forms on the screen, using Tab to jump from one box to the next, and in many cases auto-filling in the form as it jumps. You can move it up to the seldom-used Esc spot, but keep it in that area. You never addressed the Del X key, near the Help key. Have you ever used that Del key? And while Num Lock is no longer used, I use the Clear function a lot when I am using the calculator program, so it's a keeper. Thanks for your article, maybe it will spark a debate, but human inertia - doing things the way we've always done them - is hard to overcome. Thanks for writing. I don't pretend to have all of the answers, but I hope I've come up with some good questions. I have used the forward Delete key rarely, mostly when I was doing book design and dealing with small type on the screen. You place the cursor as best you can and then use whatever delete key does what you want. And I'm sure that 98% of computer users never use it. I've never used a program that used the Pause/Break key, but I can see where it might be useful. Most of all, I want to eliminate the headaches caused by accidentally toggling the Caps Lock key. Oh, and Help. The other suggestions are icing on the cake.